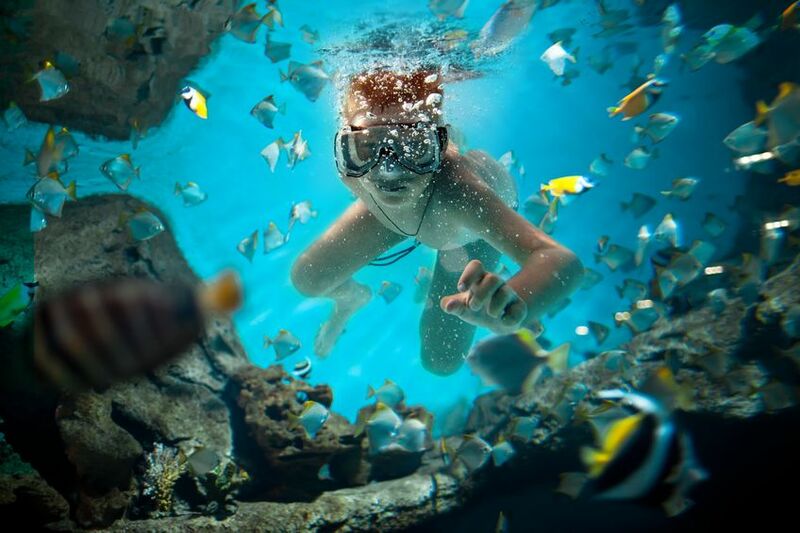 Explore the colourful Grand Bahama sea on a snorkeling or diving adventure. As part of one of the largest reef systems on Earth, the reefs of Grand Bahama Island are absolutely spectacular. They are so extensive, a long time ago people made a living purely by salvaging the ships that wrecked on the reefs. So, set out on a unique adventure to find underwater treasures, such as the Hawksbill turtle, seahorses, dolphins, Caribbean reef sharks, and many species of coral and fish. DivingGrand Bahama Island’s reputation as a diver’s paradise has been growing ever since the earliest episodes of ‘Sea Hunt’ were filmed here in the late 1950s. When visitors choose to dive deep into the crystal clear waters of Grand Bahama, they will find detailed coral gardens, playful dolphins, and inviting blue holes. There is so much to discover beyond the beach! Oddly enough, the majority of visitors barely enter this magical world. Instead, they prefer to try their luck at the casino, or relax in a chair by the pool and catch some rays. Trust us— if you choose to venture out on a dive boat, you’ll be completely captivated by what you find in this amazing underwater world. Dive with DolphinsGrand Bahama Island is one of the few places you are guaranteed to dive with dolphins in the wild. This is done through the Underwater Explorers’ Society’s (UNEXSO) “Dolphin Dive” program where local dolphins from the Dolphin Experience frolic with divers at a reef about a mile off shore. Many people can only imagine getting this close to a dolphin in the wild. Don’t miss out on this rare and amazing experience; swim with them right here on Grand Bahama Island. Dive with sharksIf you want to dive with sharks, there are two feeding programs you can participate in on Grand Bahama Island; one with UNEXSO and another with Xanadu Undersea Adventures. In both programs, an experienced shark feeder wearing chain mail offers fish to a swirling group of Caribbean reef sharks. Anyone who’s done this dive will tell you that it makes for an incredible photo opportunity. The adventure will typically begin with a detailed briefing at the dock. The shark feeder will run through the various phases of the dive, then you will travel to the dive site together via boat. Once in the water, you will soon be amazed at the sights around you. You will often see 10-25 sharks, varying in length from 4 to 9 feet, many of which will come quite close to the group. Definitely an experience to remember! Best Dive Sites on Grand BahamaIf you’re an avid diver, you’ll benefit from knowing what some of the most unique and best dive sites are in the areas surrounding Grand Bahama Island. Deep Dive SitesTheo’s WreckSunk for UNEXSO in 1982; Theo’s was a 228-foot cement hauler. She lies on her port side at 100 feet, adjacent to the continental shelf. The dive includes two penetrations – the engine room and the cargo hold. A giant green moray plus a few spotted eels sometimes reside in the wreck. Jose’s WreckBalanced between two separate coral heads, this 40-foot tugboat allows divers to swim under the hull. Lobsters and crabs can occasionally be seen hiding in the crevices between the wreck and the reef. In the winter, congregations of tiger groupers are in the vicinity. Edge of the LedgeThe mooring is set at 100 feet on a sandy bottom. To the south, you will see the slope of the continental shelf that drops off dramatically. Following the ledge, you will see small scattered coral heads. Keep an eye out for hammerhead sharks, eagle and manta rays that may be cruising by the ledge. Gale’s GrottoAt the mooring, you will find solid coral with surge channels that gradually slope off to a depth of 80-90 feet. This site is close to the shark feeding area, so it is possible to see a shark or two swimming by. Littlehale’s LairNamed for the National Geographic photographer, Bates Littlehale, this site has two lairs (small caves) created by the coral growing over the surge channels. It is possible to swim through the most westerly of these two lairs. This area is loaded with white, French and blue striped grunts. Medium Dive SitesSPID CitySPID is an acronym for the Self-contained, Portable, Inflatable Dwelling that was once used for short term habitation experiments in the mid-to-late ‘70s. A twin engine Aztec aircraft, once used in the “Sea Hunt” series, is nestled on the sandy bottom. Large schools of blue parrot fish are often seen grazing on the bottom. As you head south, the coral will become solid with surge channels running through it. This site is very close to the location of the shark dive, so you may see one or two Caribbean reef sharks passing through. Arrow PointThe coral heads at this site form a rough triangle, hence the name. You can see a bit of everything here; sandy bottom at the blue hole; scattered coral heads to the east and more solid reef to the west and southwest. A blue hole, eel garden and stingrays are some of the highlights. Picasso’s GalleryHere you find a pretty string of coral heads on a sandy plateau that should be visited as pieces of art in a gallery. On one isolated head, there are star corals of three different colours. Take your time to examine the individual coral heads as you can often find arrow crabs or red banded coral shrimp in their nooks and crannies. Further south, the scattered coral heads become a more solid fringing reef. Ben’s Blue HoleAt this site there is a horseshoe-shaped ledge with several coral heads growing on the lip. This ledge is a blue hole and part of a large fracture that runs east from the mooring line. By following the fracture over two coral heads, you will find another small blue hole behind the second coral head. Very often you will find jacks, schoolmasters, dogsnappers, porkfish and schools of Creole wrasse by these holes. Etheridge WreckOnce a car ferry operating in the Carolinas, this vessel was featured in the movie “Halloween”. Sunk in early 1992 in an area of scattered coral heads, schools of silversides, shad, schoolmaster snappers and grouper make their home in and under the wreck. Shallow Dive SitesTreasure ReefThis site received its name in the mid-sixties when four young men stumbled on an old Spanish wreck that contained several thousand silver coins. The coins recovered from this area have been estimated to be worth about three million dollars. Today, schools of blue, striped, black and French grunts are prevalent. Wide, white sandy surge channels have formed between the overhangs of Elkhorn, brain and star corals. Pillar CastleNamed for its large stands of pillar coral, one on a finger of reef just north of the main reef area, another directly across from the mooring. The south end is hollow, forming a cavern that is usually filled with fish in the late summer – silversides, sometimes glass eyed sweepers or hatchet fish. Occasionally, it can be the lair of a large green moray eel. Rainbow ReefNorth of the mooring, there is a broken bottom with two stands of pillar coral. Hovering over this area are schools of yellowtail goatfish, grunts and sergeant majors. There is mountainous star coral surrounded by a stand of Elkhorn coral. Schools of silversides occupy the cave formed under the coral. Sea HuntPortions of the television series “Sea Hunt” were filmed here. West of the mooring, there is a large isolated start coral that hosts sea fans and other soft corals. Blue headed wrasse, blue and grey cromus, and sergeant majors swim above the coral head. You may see a dark male sergeant major guarding a patch of purple eggs. The eggs are either attached under the overhand or on the hard bottom below. Blackbeard’s SpringsThis is a very pretty site on the eastern end of a large stretch of coral. At the mooring, there is a blue hole that is about one foot in diameter. This hole will either be blowing or sucking depending on tidal movement. At the eastern end of the reef, you can normally find large school of grunts, snappers or perhaps some Bermuda chub.